I wish I could say I was the Bear Whisperer, I really do. That I possessed some secret communion with the polar bears here. Some sixth sense, some special sign. Achieve zen mastery and see the bear before I even see the bear. Send a whisper upon the wind that is carried from my lips to ursine ears. There may be some secret to spotting polar bears, somehow finding a white bear in a field of white ice, but nobody’s shared it with me. I hear a helicopter and suitcase full of BBC money is a good starting point. Down here in the real world, it’s a matter of grim determination. Of scanning every stinking piece of ice in the hope against hope that maybe there’s a bear in there somewhere. Hours after hour with my weighty, overpriced German binoculars glued to my eye sockets. And still, no bears. No wonder all the other passengers hated me. Out here, all alone, with no one to impress except my iPhone on “N” for Narcissistic, I tone it down. Still, after 10 or 12 hours of this, I get a little punchy and start calling out my sightings. Look, there’s a head. A rump. An ear. An ear. Attached to a head. Laying on a paw. Sound asleep on the ice a hundred yards away. The clouds part, the angels sing, the polar bear gods smile and I am truly blessed. 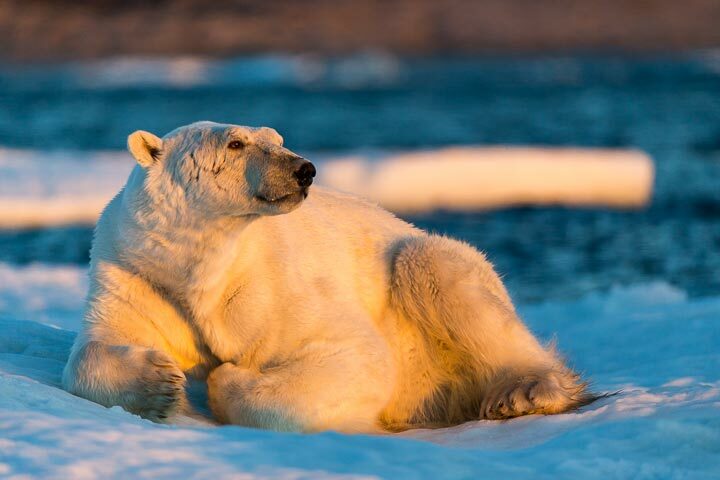 He sleeps on as I fight the wind and bounce off a few icebergs, then opens his eyes to see what the commotion is about. But he isn’t stressed, just curious. As soon as he stands I can see he’s frightfully thin, a oversized and sagging suit of fur hanging loosely where fat and muscle once filled out. He sniffs the air, trying to sort out the mixed scents of unwashed human, leaking oil and mouldering laundry. Bears, even hungry ones, have standards, and after a moment he settles back down to sleep. I make my pictures as quietly as possible, trying to somehow capture all of it; the light and the majesty and the essential struggle for survival that is here before me. Somehow translate all that into pixels on a screen. This entry was posted on Tuesday, August 18th, 2015 at 2:42 pm. It is filed under On the Road. You can follow any responses to this entry through the RSS 2.0 feed.